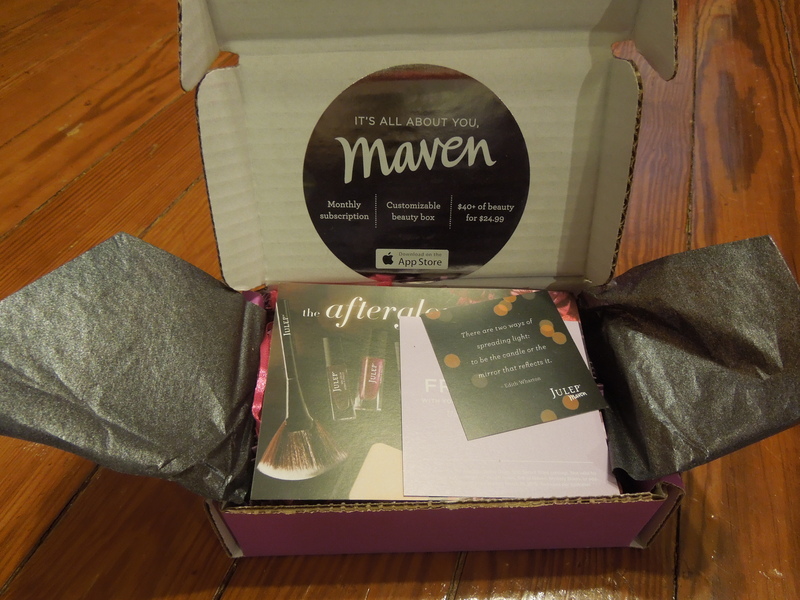 For February, Julep introduced “The Afterglow Collection” which I gave you a sneak peek of in my NYC Maven meet up post. This month’s makeup fix highlighted, well, highlighters. 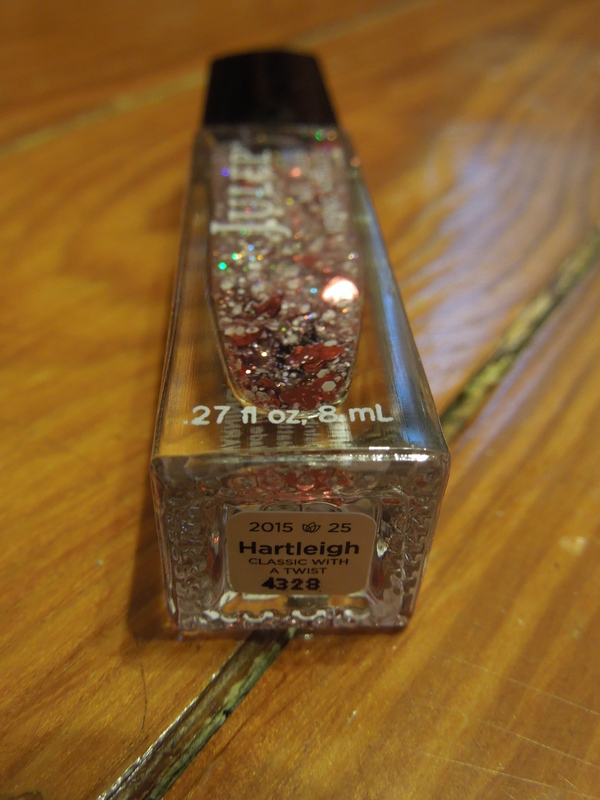 Since I’ve got plenty of those in my makeup bag, I opted for a polish heavy month and chose the 3 polish It Girl Box. I also went a little nuts with polish add ons. 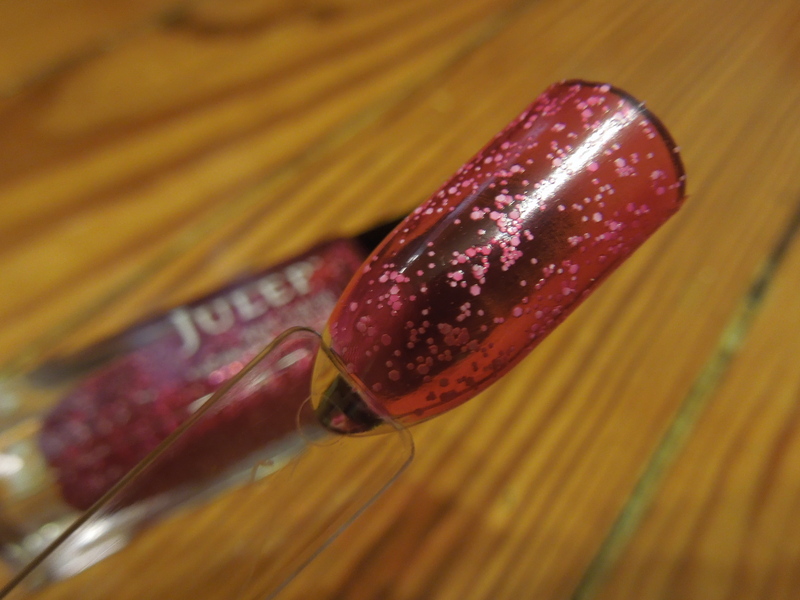 For some reason Julep’s paler pinks never photograph true to life for me. This shade isn’t as pale as it looks and is a lot more of a sweet petal pink. The formula went on so easily and I think this is a nice subtle Spring option. Becky reminded me of Julep’s Borealis shadow that I am in love with so I had to have it. If you like edgier shades, this one is a must have for you. I can’t wait to experiment with it using some different topcoats. 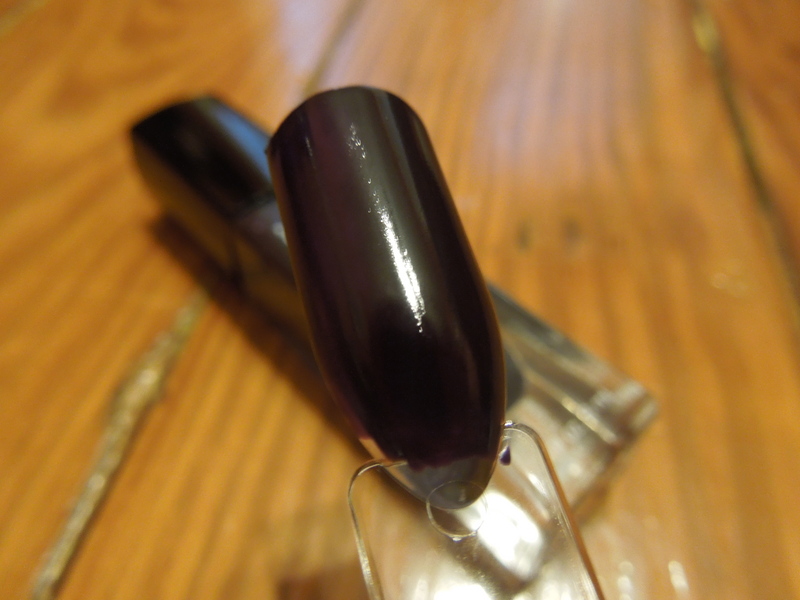 This is a black shade with a purple undertone. There’s nothing wrong with it but it’s just not super exciting. I really consider it a bonus because I wanted the other two colors in this box and it will work well as base for a lot of my cool topcoats. For full disclosure, this bottle and one of my add-ons came leaking (all the excess was under the caps and around the rims) I sent Julep out a pic and they immediately responded and sent me out new ones. 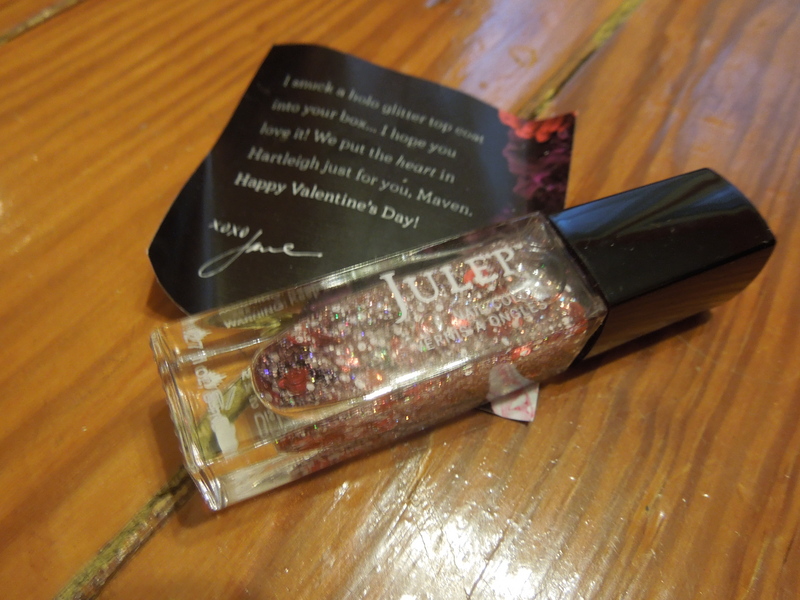 Julep has a tradition of sending us a free Valentine’s themed polish and this year we received the adorable Hartleigh. 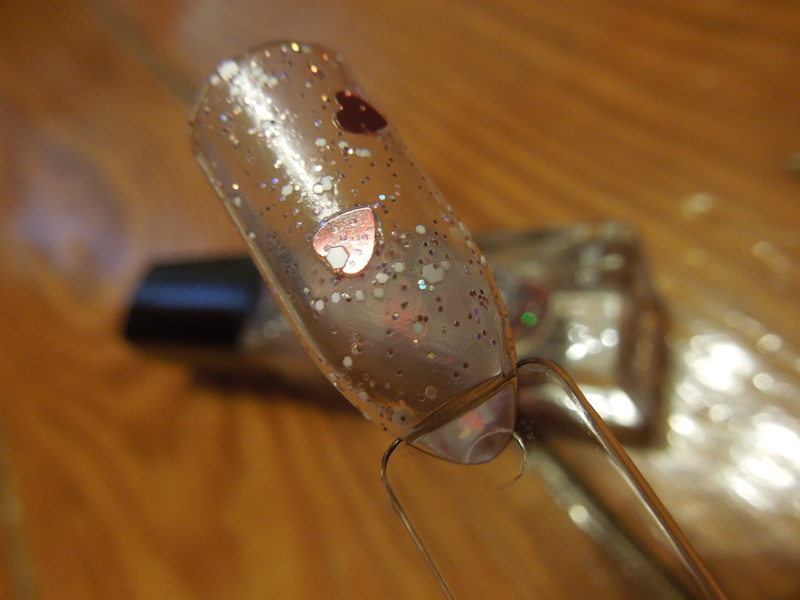 You can never have too many polishes with glitter hearts in them, seriously folks. This is free so automatically it’s a win. In terms of application, I had a hard time getting a lot of hearts out. You’re going to have to do a little calculated digging if you want a certain number of hearts. 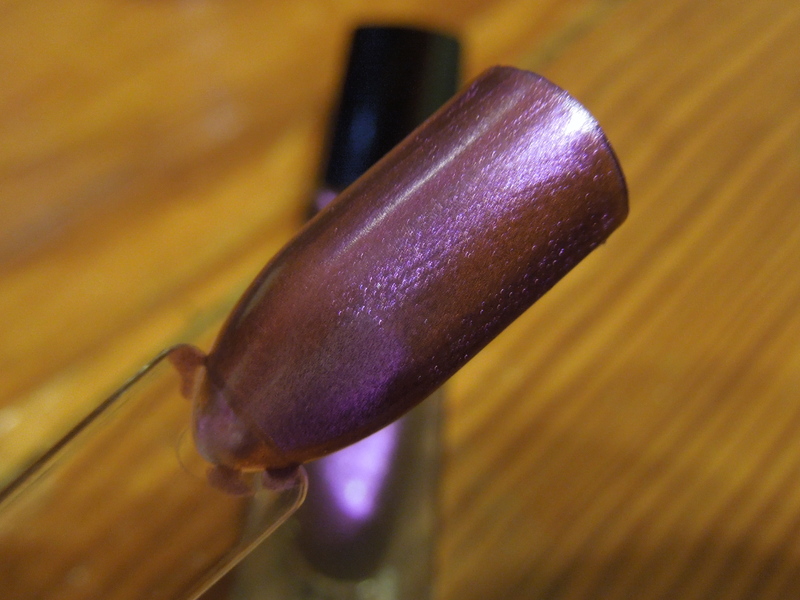 But the polish is pretty and it’s a great freebie. Description: A lightweight, fast-absorbing organic moisturizer known for its healing, conditioning, and anti-aging effects. Use a couple drops to hydrate a thirsty complexion (it’s good for all skin types), smooth split ends, or soften rough cuticles. Argan oil is a lifesaver during the winter season. You can add a few drops to your regular beauty products for a great moisturizing boost and you can use it directly in tons of ways. From scalp treatments to combatting frizz, Argan oil is a beauty multi-tasker. It’s typically on the expensive side, but it showed up as a $4.99 add-on and I jumped right on it. It’s a great value at that price and I know I’ll need it during this winter of our discontent. Verdict: It had to be you..it had to be you…. The moment I saw Hazel I knew she would be mine. She just has this amazing glow about her. The duochrome effect isn’t that obvious to me, but it’s such a beautiful shade. I’m going to be trying this one out with a matte topcoat. Verdict: I don’t think you’re ready for this jelly..
A new finish! And it’s called “fizzy”! How could I not get this? (Clearly that is a rhetorical question.) I love jelly polishes so this one was a must have. It goes on very easily for a jelly polish and looks great with only two coats. It has a unique speckled finish which makes it different from my glitter jellies. If you like jelly polishes, you should definitely give this one a shot. 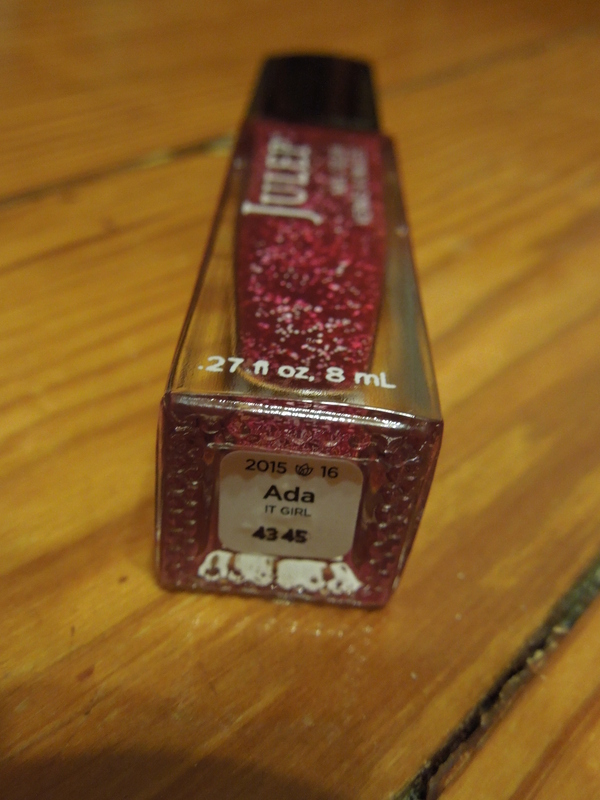 Ada was the other polish that had some leaking and was replaced promptly by Julep. Verdict: Girls just wanna have fun..
Last month Julep sent out one of these three topcoats to maevns for free. 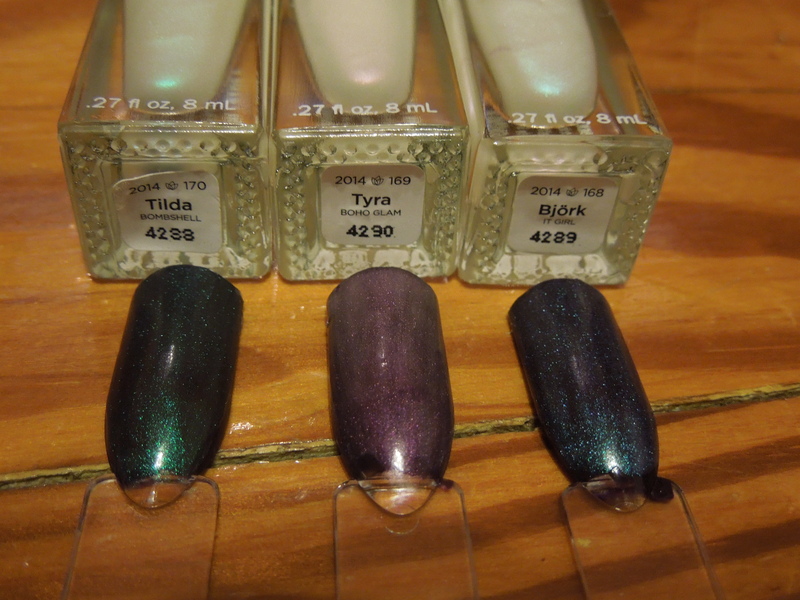 I got Tilda and vowed to finish out the collection when they were available for sale. The full set was an add on and it was more cost effective to pick up the whole set than the two bottles I was missing so I nabbed it. I’ve got swatches of them on their own then a before and after with Colton. I think these topcoats are a ton of fun to play with and the ladies that are adept with nail art could do some really phenomenal designs. On their own (or with lighter shades) they give a subtle sheen. Over darker colors they do change the shade quite a bit. Personally I think the current price is a bit high so I’d wait until there was a sale or a coupon code to grab them. I’ve actually lost track of the number of Tatianas I’ve given away. I think it’s up to three. 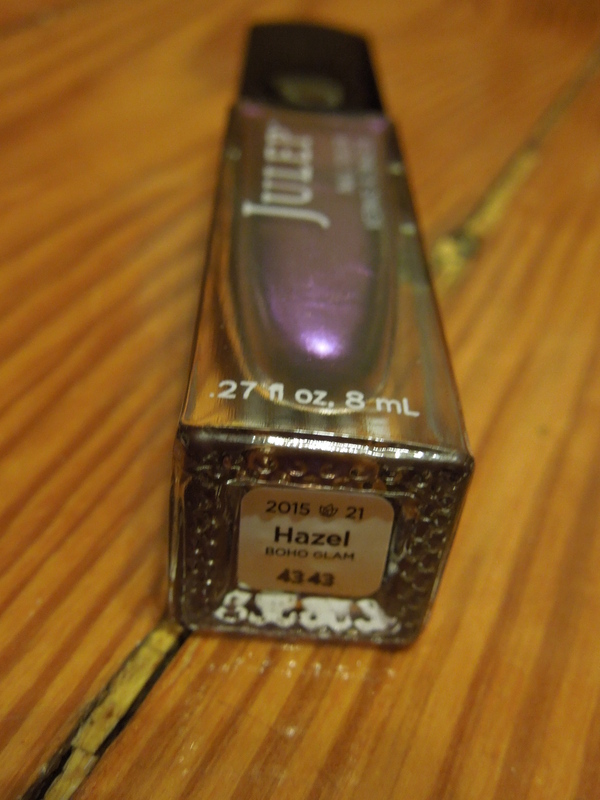 Tatiana is one of Julep’s go-to shades for freebies and mystery boxes. On her own I don’t think she works so well with my vampire complexion but I caught someone wearing it underneath a matte topcoat and I thought it was amazing, so Julep you win. I am finally keeping a Tatiana in my collection. We both knew if you just kept sending her to me, eventually I would break. Queen Anne is another polish Julep likes to give away. I already have one, so I didn’t swatch this and instead saved it for a gift. 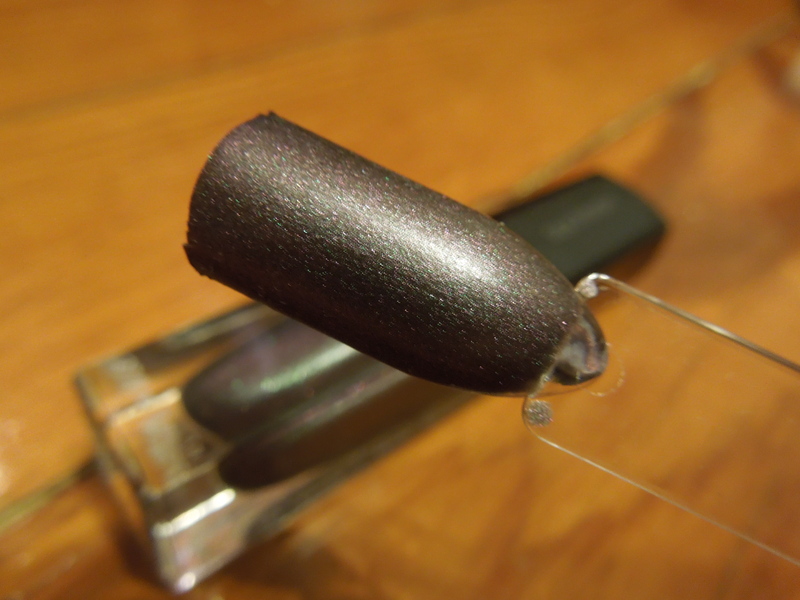 This is a really pretty shade with a lovely sparkle. It will be a nice transition shade into spring. 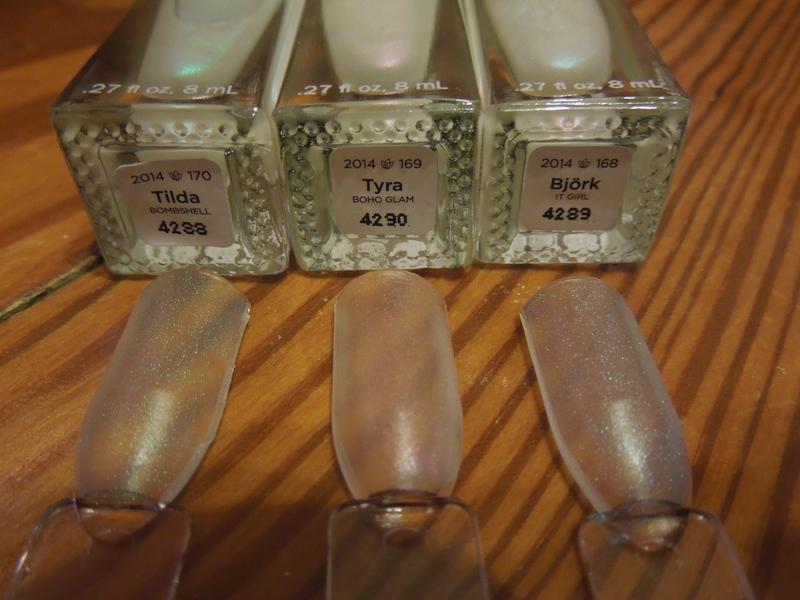 I picked up some really interesting polish shades that aren’t too similar to what I already own. This box had a lot of product and I only paid $53.45. The regular retail on all these items is $176.00 and with maven prices and sales the cost still comes out to $130.40. 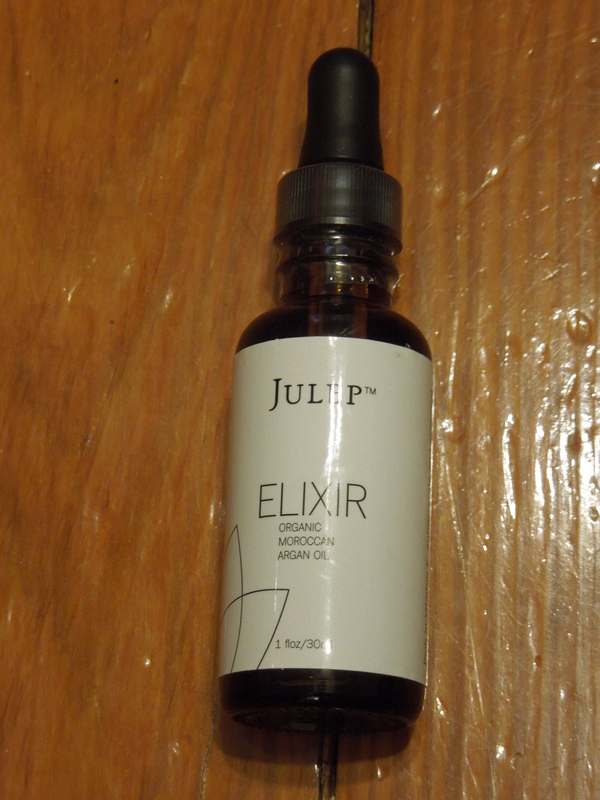 Did you pick up anything from Julep’s February box? Did you opt for beauty products or was it polish all the way? Get a free glam clutch & polish with your $25+ Order – Just use code: REDCARPET at Checkout! Just remember this signs you up for a monthly subscription. 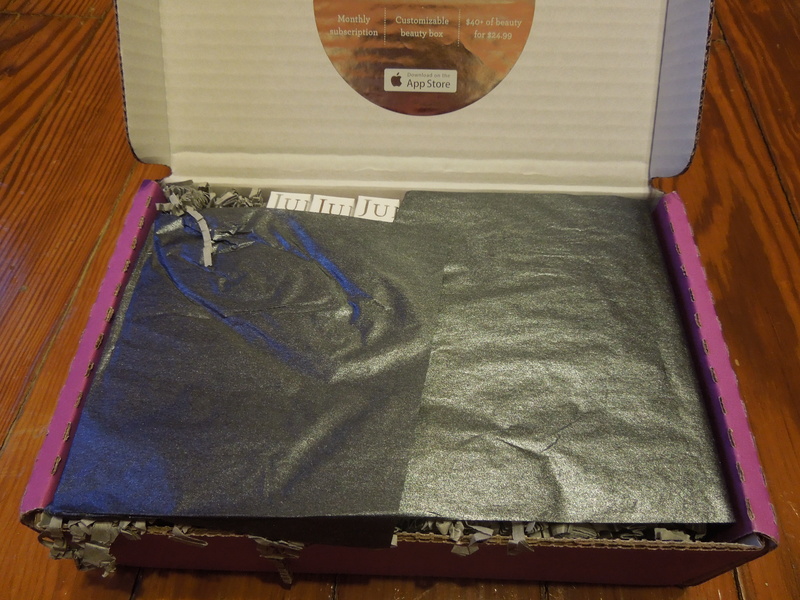 If you don’t wish to receive boxes you will need to call Julep to cancel. You can also opt to skip a month and you will not be billed. Wow, you got a stellar deal! I really enjoyed this months box, Hazel was my favorite! I love Hazel. I can’t wait to try her with a matte topcoat. I got Hazel and Brandis, plus the highlighting powder. I love them, especially Hazel. I did a pedicure with it. I do wish that the bronze came out a bit more, though. I didn’t really notice the bronze much at all myself, but it’s so pretty without it I didn’t mind. 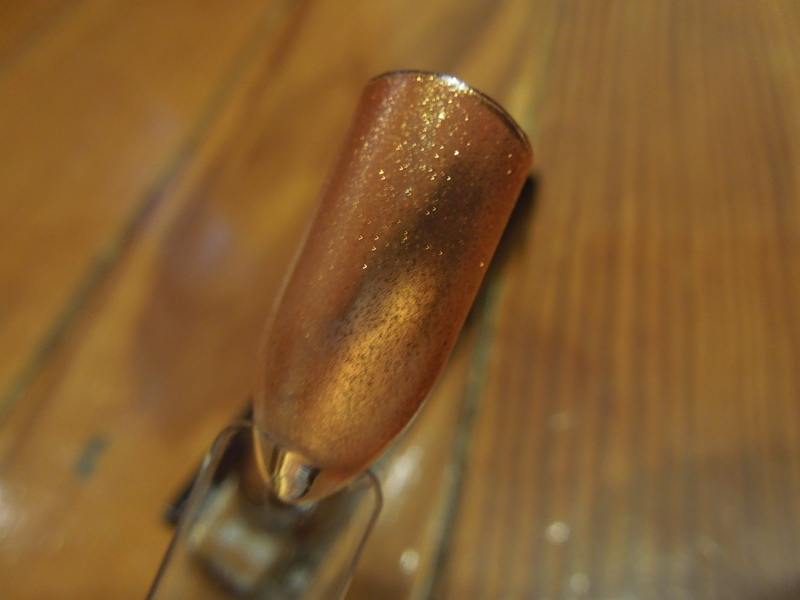 I’m wondering if I try it with some different special effect style topcoats if the duochrome will come out more.